Reporting an issue with the app (or via SeeClickFix.org) is much better than ranting to someone else about that ever-growing pothole, and you’re even awarded “civic points” for doing so. This means instant gratification, plus the good vibes associated with civic engagement. Once the app has been installed on your phone, you can register as a user or choose to report issues anonymously. If you prefer to use the website instead, navigate to seeclickfix.org and either choose to register or click the ‘report an issue’ button to start fixing. As a frequent walker and sometimes runner, nothing grinds my gears more than missing or faded crosswalks. In addition to their role in promoting pedestrian safety, I think of well-maintained crosswalks as an indicator of a city’s attentiveness to infrastructural and quality of life issues in general. I recognize that all of that yellow paint is probably expensive to maintain, but a pedestrian can dream, right? I’ll be sure to write a follow-up post if and when one of my issues is addressed. Until then, I look forward to competing for civic points with my fellow New Bedfordians. An article posted on The Atlantic Cities, tells the story of the shutdown of a manufacturing plant and a community colleges unique approach to revitalization in Dayton, Ohio. Dayton was once home to a GM manufacturing plant which is now closed, leading to the loss of some 26,000 jobs. The shut down left many unemployed and the empty buildings a reminder that manufacturing jobs are long gone in Dayton. There is a bright spot on the map of Dayton however. Sinclair, a local community college is taking a new approach to higher education. In summation, the community college has a field of study in Unmanned Aerial Vehicles, or UAVs. The college’s President, Steven Johnson, explains that the UAV training program is part a new educational model, to prepare students for the diversified 21st century economy. Johnson explains that the typical 4 years of college from the age of 18 to 22 doesn’t work for everyone. He sees his community college as a place for ongoing learning and an opportunity for people to return to school to refresh their knowledge and possibly retrain in a new field. This is the new educational model he is calling ‘just in time’ education, paralleling the idea of ‘just in time’ production. This had me thinking of Bristol Community College here on the south coast. Situated in the struggling economies of the south coast industrial cities, I wondered whether there were any programs available tailored to new technology that may be coming to the region. What I found was similar to that of Sinclair in Ohio. In the new era of green technology and renewable energy, the south coast has been the focus of the wind turbine project, Cape Wind. It seems as though Bristol Community College is prepping its students for ‘just in time’ education as well. The college offers a Mechanical Technology with Wind Power Career Program which contains courses in mathematics, manufacturing and materials. While only one course is offered pertaining specifically to wind technology, the program has many elective opportunities for specialized learning that would prepare students for a career in the wind energy manufacturing industry. Nearly half of the population of the greater Dayton region, 550,000 people, has taken at least one class at Sinclair. Hopefully residents of the south coast can look at BCC as a place to refresh and retrain as many residents of the Dayton, Ohio area have to Sinclair Community College. Can music save your mortal city? It’s also worth noting that this effort, which engaged some 5,000 residents and more or less shut down the city, was actually a response to Newsweek calling Grand Rapids a dying city. With choreographed pyrotechnics, tumbling, interchangeable troubadours, and even a helicopter flight, the city looks very much alive. Maybe this is something for Lawrence, MA–recently dubbed “city of the damned” by Boston Magazine–to consider trying out as they work to battle ever-worsening perceptions. http://publicpolicycenter.org/wp/wp-content/uploads/2014/11/UMassD-PPCenter-sm1.png 0 0 Colleen Dawicki http://publicpolicycenter.org/wp/wp-content/uploads/2014/11/UMassD-PPCenter-sm1.png Colleen Dawicki2012-05-31 14:30:362012-05-31 14:30:36Can music save your mortal city? The University of North Carolina-Wilmington gave some great workshops during the conference, including one that featured a coalition developed by their Watson School of Education to encourage a community-based, collaborative approach to dropout prevention. The coalition includes representatives from public schools, parent-teacher organizations, nonprofits, and religious organizations whose initial goal was to raise awareness about dropout prevention and bring a comprehensive set of resources to the table. Since it began last year, the coalition has expanded to conduct shared programming and research that highlights best practices and matches needs to existing resources. There are three particularly noteworthy elements of this effort. First, no money is on the table. Instead, partners came together because they share the mission of preventing dropout. Plain and simple. While there are plans to fundraise, this coalition did not come together as the result of a grant (or a grant requirement), which means it has a far better chance at sustainability than efforts where money does the leveraging. Moreover, this approach has allowed the coalition to instead focus on making connections between existing needs and assets that needed better coordination, not more dollars. Second, a huge part of this effort is about information sharing. As a research center at a university not unlike UNCW, we see one of our most important roles as serving as a knowledge base, linking practitioners to research, data, and best practices that they rarely have time to uncover themselves. In this case, UNCW is working with the National Dropout Prevention Center and its own faculty to share examples of what works with schools and community partners across the region, again at low or no cost. We think this is an approach that is most definitely worth investigating in our own community. Interested? Let us know! The community can then add their ideas to the collection of post-it notes that are being monitored by city decision makers, including the mayor, the police commissioner, and the chief education officer. Click here to see what Philadelphians are saying. Could this kind of campaign work in the South Coast? What would you ask? A city without a bookstore? When Patchett’s hometown of Nashville lost its last bookstore last year, the best-selling author did something about it: she started her own. In many cities, bookstores play an important role in civic engagement, serving as informal meeting places, promoting intellectual discourse, and hosting authors from a diverse variety of genres and viewpoints. Central Connecticut State University uses the presence of bookstores as an indicator when crowning “America’s Most Literate City.” The Daily Beast takes things one step further, determining “America’s Smartest (and Dumbest) Cities” based on factors that include nonfiction book sales. In 2010, the Providence metropolitan area (which includes New Bedford and Fall River) ranked 30th in the latter study, but it can be presumed that the presence of universities, not bookstores, drives the results significantly. Because while Providence has its fair share of resources for bibliophiles (my personal favorite is Cellar Stories downtown), options in New Bedford and Fall River are relatively limited, particularly if you’re looking to buy something new. Since Baker Books left New Bedford to open its Dartmouth store, the only options of which I’m aware include the Whaling Museum (naturally, topic selection is quite limited), Upstairs Used Books (on Pleasant Street, next to Spicy Lime), and Antiques at the Cove, which has an overwhelmingly large section of used books. As for Fall River, the only option I can find (besides the bookstore at Bristol Community College) is a place called Bargain Books. At the same time, if Nashville, TN–a city of about 630,000 residents with a bustling tourist trade and a handful of universities–wasn’t able to support a bookstore, can New Bedford or Fall River? http://publicpolicycenter.org/wp/wp-content/uploads/2014/11/UMassD-PPCenter-sm1.png 0 0 Colleen Dawicki http://publicpolicycenter.org/wp/wp-content/uploads/2014/11/UMassD-PPCenter-sm1.png Colleen Dawicki2011-11-28 09:34:332014-11-04 12:10:30A city without a bookstore? New Orleans artist Candy Chang created this project to engage city residents in a conversation about what to do with vacant storefronts. Read more about this innovative project here, and see the sticker for yourself below. 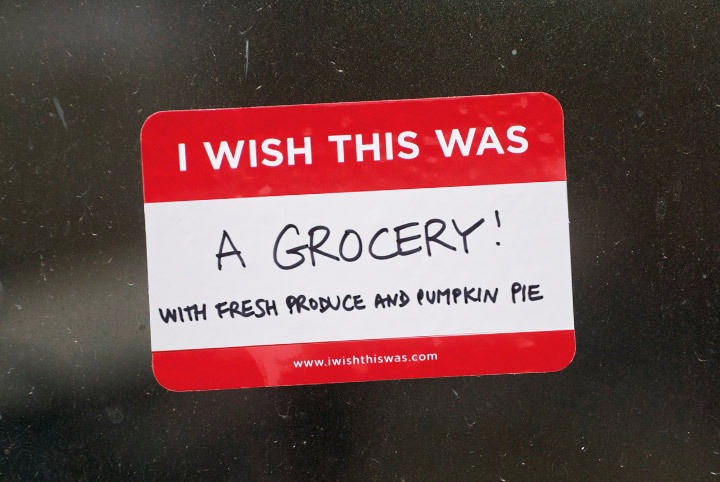 Better yet, buy the sticker and start the conversation in your own community! This sounds a lot like a conversation my husband and I have when walking around our New Bedford neighborhood (our conclusions are almost always a bakery or a Jewish deli). But the idea of putting those ideas on a sticker is quite appealing, especially because the stickers are designed for easy removal by the person who puts those ideas into action. More and more urban policy research is looking at the critical role today’s 20- and 30-somethings (sometimes called Generation Y or Millennials) play in our cities. Just today, Brookings reported on migration trends of the 25-34 set–we’re apparently leaving young adult bastions like New York and LA for “cool” places like Portland, Austin, and DC. New Orleans is another non-traditional destination growing in popularity, according to this Next American City article. Indeed, I can count at least a handful of friends who have recently relocated to the Big Easy to teach, attend grad school, run nonprofits, and deal with the aftermath of the oil spill. This is hardly a valid or generalizable sample, but I doubt any of this crowd imagined themselves living in Louisiana upon graduating from college. If there’s a land of opportunity for my cohort, a glut of sources suggest it’s Detroit. (I’d argue that it should also include Gateway Cities like New Bedford and Fall River, but that’s for another day.) A recent editorial in the Detroit News argues that “Millenials will save Detroit.” And they have plenty of opportunities to do so, from social networking sites like “I am young Detroit” to the Detroit Revitalization Fellows Program, which nurtures a new generation of city leaders. At least from an outsider’s perspective, Detroit seems to offer young people a blank canvas with which to try new ideas, get their hands dirty, and have their voices recognized in the policy process. I’m a big fan of GOOD magazine (or at least their website) for its ability to make policy topics engaging and relevant and its cross-disciplinary approach to tackling challenges in cities, education, the environment, etc. etc. They devote quite a bit of content to design, and my news feed highlighted a recent bit they did on a new initiative undertaken by AIGA (the design world’s professional association). Called Design for Good, this engages graphic designers in efforts to use their talents to improve outcomes in their communities. Aligned with AIGA’s efforts is GOOD’s recent challenge to designers to redesign the report card. Think about how effectively this could show parents not just where their kids stand, but how their kids compare to their peers in the classroom, district, and maybe even students statewide. It would be interesting to see if making student-level data more accessible and digestible will result in a higher level of parental empowerment and engagement.